Some galleries use the winter holidays to take a month off of exhibiting, starting back up in mid- or late January, but not Western Exhibitions and Director Scott Speh. “The Power of Selection, Pt. 1”opened January 2nd at Western Exhibitions and continues to February 6th. Curated by Ryan Travis Christian, “The Power of Selection, Pt. 1” is the first of three exhibitions aimed “to increase the circulation of contemporary artwork seen in Chicago by showing works by out of town and/or up-and-coming artists,” and indeed, aside from Michael T. Rea, all the artists on view are based in Los Angeles. The gallery itself is dominated by Rea’s massive wood construction, Tsavo Manhunters, Part 1 (2009, seen at left). Appearing as a cross between two famous movie robots, the AT-ST from Star Wars and RoboCop’s ED-209, Rea’s Tsavo Manhunters seems to threaten viewers as they enter the gallery space. With two carved lion heads hanging off of the back of the machine, the work also references the “Tsavo Maneaters,” an infamous pair of lions that stalked and killed workers on the Kenya-Uganda Railway in 1898. The lions were then hunted and killed themselves; their remains have been reconstructed and are on display in Chicago’s Field Museum. This historical event was the basis for the 1996 movie The Ghost and the Darkness, starring Michael Douglas and Val Kilmer, adding another movie to Rea’s mix. Rea reifies boyhood fantasies and in doing so raises questions about the accepted pervasiveness of violence in American society. Here, he deflates the supposed grandeur and prestige of big game hunting by showing it as mechanized and determined; the lions are already dead and hanging from the back. Conversely the title could also indicate that this is a vehicle for lions themselves to “manhunt” from, perhaps they have rescued their fallen comrades from the Field Museum and will use the vehicle to wreak a vengeance on the humans that wronged them. Michael Bay and J.J. Abrams are you listening? Also of note in “The Power of Selection” is Allison Schulnik’s video Forest, which is also the music video for “Ready, Able” by the hot indie band Grizzly Bear, seen above (still seen at top). The subject of the film is a Big Foot-like figure that wanders in a forest coming upon various creatures and is eventually abducted by aliens. 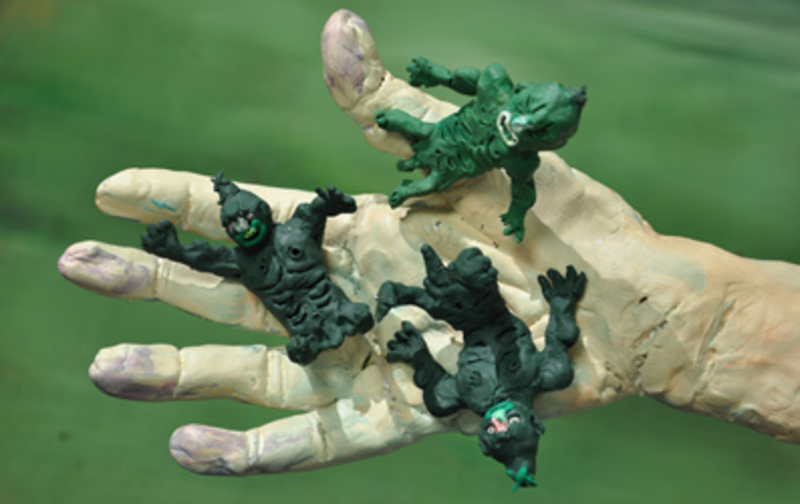 Modeled in clay and using stop-motion animation techniques, the appearance of the characters in the film resembles heavy paint, to a degree. The natural elements of the film, close-ups of water, bark, grass, lichen, and figure-in-nature subject seem to reference American Transcendentalism with a good bit of psychedelia and melancholy mixed in. The match of Schulnik’s method to Grizzly Bear’s music is perfect and the ultimate narrative of the film is elusive. This leaves each viewer to puzzle over and reflect on his or her experience, long after leaving the gallery. Make sure to see the additional show at Western Exhibitions, “Suitable Video: Works from the Suitable Exhibitions Archive,” curated by Scott Wolniak. Culled from the archives of the now-defunct alternative space Suitable Gallery (1999-2005), these videos cover a broad range of artistic practices from the gross-out oeuvre of Paul Nudd, to the “conventions of early Feminist performance video” from Kirsten Stoltmann. Spend some time in “Suitable Video” after “The Power of Selection,” both shows are rewarding.